The animal-based meat, dairy, and egg companies are not committed to killing and hurting animals as much as they’re committed to making money. If the meat, dairy, & egg industries could make as much money NOT killing and hurting animals, they’ll do it. Buying into the success of vegan companies enables them to do that. Isn’t that what we want? The plant-based foods market recently topped $3.1 billion in sales and is slated to reach over $5 billion in just a couple years. As a result, the animal-based meat, dairy, egg, and other large corporations see vegan companies and the plant-based products they make as competitors they should fear, emulate, learn from, collaborate with, invest in, or even purchase. They recognize they need to “buy into” the success, growth, and future of the plant-based market. Some, however, see it as vegan companies “selling out,” choosing profit over principles and betraying their loyal vegan customer base. On today’s episode, we explore the many perspectives of such business decisions and speculate about who the biggest winners are in the end. Listen below or subscribe on iTunes, Soundcloud, Stitcher, Google Play, or Spotify! It’s only because of supporters that such episodes exist. Please become a supporter today, and thank you to those who are! The meat, dairy, & egg companies would stop killing animals if they could make as much money. 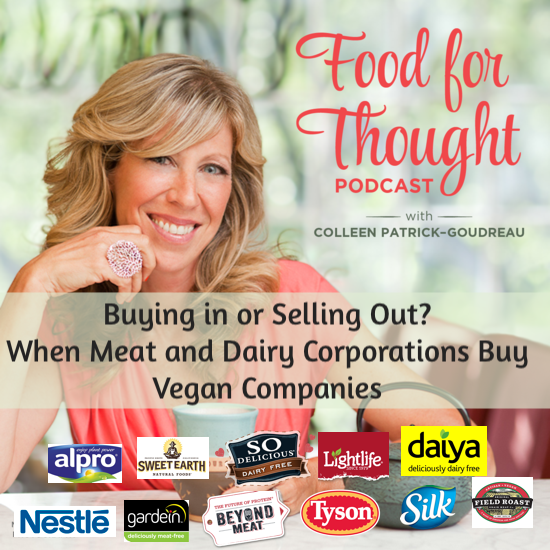 Buying into the success of vegan companies enables them to do that. Isn’t that what we want?